A paratrooper who learnt to walk again after losing three limbs to a bomb has spoken of his joy at regaining his independence by moving into a new home. 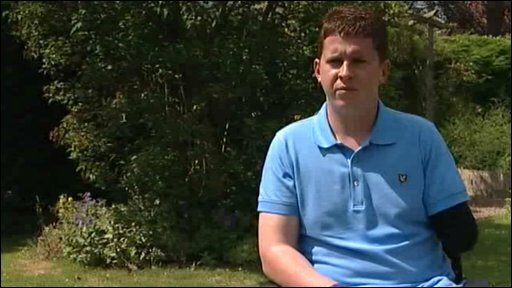 Lance Corporal Tom Neathway, 25, of Crowle, Worcestershire, was injured by a booby trap bomb in Kajaki, Helmand Province, Afghanistan, in July 2007. He woke up three days later in Selly Oak Hospital, Birmingham. L/Cpl Neathway has learnt to walk using prosthetic limbs and has gone skiing since his injury. He was filmed by the BBC using a sitski - a wheelchair without the wheels - in the Bavarian Alps. The member of 2 Para was able to stand to receive his campaign medal from Prince Charles and walk to his chair in December. He said he saw the challenges facing him as another of "life's tests". After living with his parents since being released from hospital he has now moved into a bungalow. He said: "Having to move back to my parents house was great when I first was injured and getting away from that hospital environment. "But now to be in my own place again it's great to be just able to do what I want."